A top leader of the fundamentalist Jamaat-e-Islami party was sentenced to death on Wednesday by a special Bangladeshi tribunal for committing "crimes against humanity" during the country's 1971 liberation war. 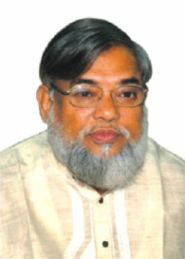 65-year-old Jamaat-e-Islami secretary general Ali Ahsan Mohammad Mojaheed was given death penalty by the International Crimes Tribunal-2, at a jam-packed courtroom. "He will be hanged by neck till he is dead," Justice Obaidul Hassa, the chairman of the three-member panel of judges pronounced, reading out the operative part of the verdict. He said five of the seven charges brought against Mojaheed were "proved beyond doubt" and the court sentenced him to death on two counts for personal involvement in the killings of several pro-liberation activists. Mojaheed, who was the second in command of infamous Al-Badr militia force, manned mainly by Jamaat's then student wing, initially looked expressionless as he was brought to the dock but appeared perplexed as the judge handed down the punishment. Al Badr had systematically killed leading Bengali intelligentsia during the Liberation War as an elite auxiliary force of the Pakistani troops. Mojaheed was found guilty of "superior responsibility" and "criminal liability" of the atrocities. The verdict comes two days after Jamaat-e-Islami's 91-year-old supremo Ghulam Azam was sentenced to 90-years in jail by a tribunal for masterminding atrocities during the war of independence. Israeli diplomat attack: Kazmi accuses "oil lobby"